Part of the Suncoast-Sunsquare casino and entertainment complex on the northern end of Durban’s Golden Mile, the Suncoast Towers is probably one of the more elegant hotels on the four-mile-long strip. 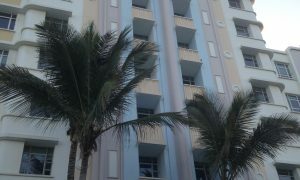 Like many of the other hotels on the beachfront, it has a quasi-Art Deco design scheme, at least on the outside. The zyggurat-fringed facade rises up to face the beach, and the pastel exterior turns a gorgeous orange when the early morning sun hits it. A placid pool area sits between the hotel and the beach, but it’s separated by a towering hedge and, strangely, does not have a view of the ocean. The bright, airy rooms have a modern-chic aesthetic, with beige carpets and accents, maple closets, and minimalist frosted-glass enclosures for the toilet and shower areas. 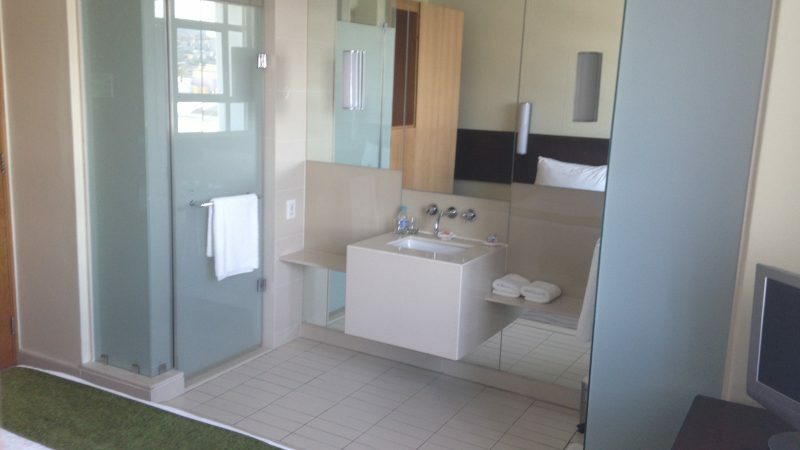 My room did not have a separate bathroom — rather the sink, shower and toilet compartment were all to be found along one wall — which is OK if you are traveling with a spouse, but this layout does not provide much privacy if you are with a friend or acquaintance. The flat-screen TV is on the small side, but the closets are ample and the bed firmly comfortable with soft, fluffy linens. My only complaint was that there were not enough power ports, and the ones that did exist were not in areas that were convenient for me — i.e. on the desk, but none near the bedside tables. Also, the free wi-fi was a bit slow, but you do get a higher daily allotment here than at nearby hotels. 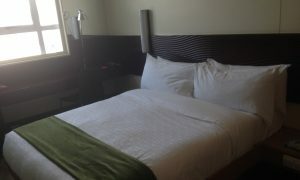 Elsewhere in the hotel is a well-kept fitness room, a lovely Asian-themed restaurant, and a fantastic ninth-floor spa. The hotel is directly connected to the casino complex, where you’ll find dozens of restaurants (a couple are high-end, but most are mid-to-low end chains), a cinema, and shops that stay open late. 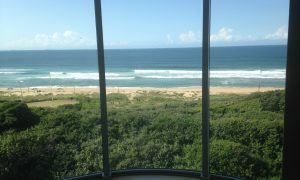 This, plus the Kids Club and easy access to the beach, make the Suncoast Towers a popular option for families, though a fair number of business travelers come through (there is a small business center near reception), and those who want to stay close to Moses Mabhida Stadium (which is 10 minutes away on foot). Service here was extremely friendly and polite — definitely a cut above other hotels in the area. 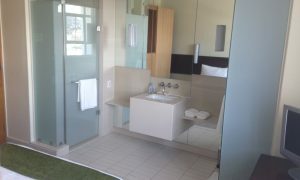 In fact, this was one of the best hotel experiences I had in Durban, and I highly recommend it. This landmark hotel is perched on the northern end of Durban’s “Golden Mile” (actually a four-mile-long promenade). 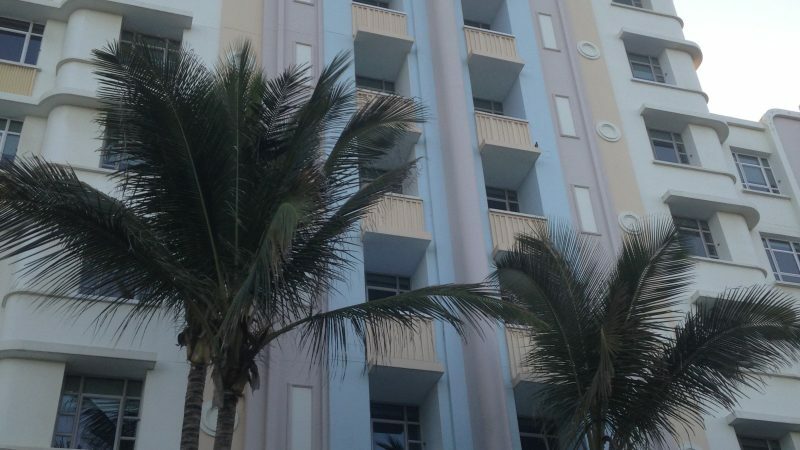 Whether you adore its striking form or abhor it, there is no arguing that the art deco-style façade painted in various pastel shades is anything but eye-catching. Inside, the colour scheme is a little more muted, with earthy browns and greens providing a relaxing feel, livened up by splashes of turquoise to match the ocean outside. It’s just a two minute walk to the beach, where the hotel has loungers and umbrellas set up for guests. There are further sun loungers on a small lawn between the hotel and the beach, just in case you don’t like the feel of sand between your toes. You could always stay in the hotel pool as well, which sits in a garden with a definite tropical feel, though it seems a shame that the pool terrace doesn’t get a view of the ocean. Suncoast’s rooms deliver just what you’d expect from a chain hotel: they’re clean, comfortable, well-equipped and incredibly quiet. You have to ask for the mini bar to be stocked, but a particularly nice touch is the range of complimentary (non-alcoholic) beverages awaiting on arrival. The hotel attracts its fair share of business travellers, but is equally suited to holidaymakers and families. Based within the complex is a cinema, a casino and a range of restaurants. Most of the latter are of the fast-food variety, though there are a couple of more upmarket options as well. Without having to set foot outdoors, you can also choose from a range of cafes, so if you’re one of those people that doesn’t like to go overboard on the breakfast buffet, it might be worth taking the room-only option and grabbing coffee and cake instead of bacon and eggs. There’s also a kids’ club in the complex, where little ones can play while the big kids play in the casino. 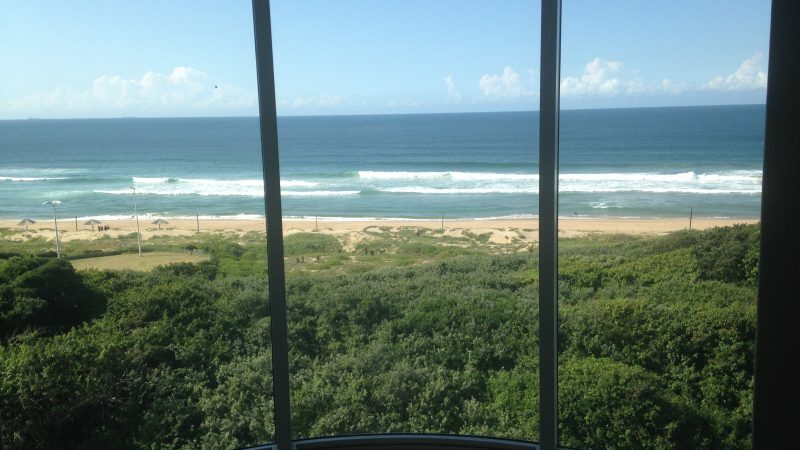 The hotel is well-located for Durban’s attractions, with the Moses Mabhida Stadium and uShaka Marine World both walkable and a range of smaller attractions dotted along the beachfront.